My dad grew up on Maui, and even though our family was raised in Virginia, we always kept SPAM® in the pantry. My dad would eat Spam with fried eggs and rice — breakfast, lunch, dinner, didn’t matter what time of day it was. As a child, I attributed my father’s love of Spam to his pedestrian food knowledge (he pronounces the J in fajita), but it turns out he’s not alone. Hawaii consumes more Spam than any state in our union — in total, 7 million cans a year. Though the name Spam is a shortened version of “spiced ham,” Army soldiers would often refer to it as “Special Army Meat.” Surpluses of Spam made their way from the soldiers’ supplies into native diets throughout the Pacific. To this day, Hawaiians love Spam Musubi, a sushi-style slice of Spam served with rice and seaweed, spam fried rice, and my dad’s favorite, spam and eggs. Spam is so popular throughout Hawaii that it’s been nicknamed the “Hawaiian steak” and is even found on the islands’ McDonald’s and Burger King menus. During the last week of April, the annual Spam Jam takes place in Waikiki. And before taking office, Hawaii’s most prominent native son, Barack Obama, surprised reporters when he ordered spam musubi while on vacation in Oahu. But Hawaii isn’t alone. In the territory of Guam, each person consumes 16 cans of Spam a year on average. In the UK, Spam fritters are served battered and deep-fried. In Hong Kong, Spam is often eaten with instant noodles. 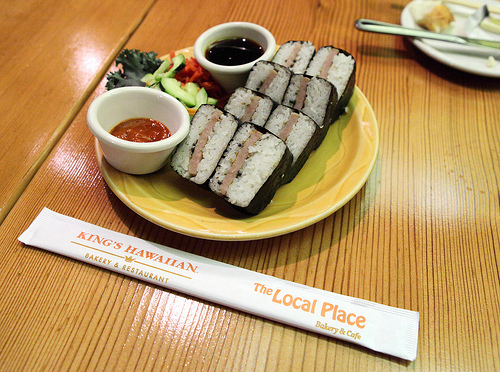 And as a result of the Korean War, Koreans enjoy Spam kimbap, a rice and vegetable filled seaweed roll.